Interstate 10 rivals would meet in first round of playoffs if the postseason started Friday. Spurs' injury/inactive report: Forward Drew Eubanks (G League assignment), out; forward Chimezie Metu (G League assignment), out; forward Ben Moore (G League assignment), out; point guard Dejounte Murray (torn right anterior cruciate ligament), out. Rockets' injury/inactive report: Forward Vincent Edwards (G League assignment), out; forward/center Kenneth Faried (left knee soreness), probable; forward/center Isaiah Hartenstein (right Achilles soreness), out. Notable: The Spurs clinched their 22nd consecutive winning season with an 111-105 victory against defending league champion Golden State on Monday night at the AT&T Center. The Silver and Black own the league record for consecutive winning seasons . . . The Spurs had won nine straight games before losing to the Miami Heat on Wednesday. San Antonio was tied with Houston for the second-longest win streak in the NBA this season. Golden State won 11 straight earlier in the season . . . The Silver and Black currently own the No. 6 seed in the Western Conference. They have the same record (42-30) as No. 5 Oklahoma City, No. 7 Utah and No. 8 Los Angeles Clippers. OKC owns the tiebreaker against San Antonio and the Spurs own the tiebreaker against Utah and the Clippers . . . The Silver and Black would play Houston in the first round of the playoffs if the postseason started Friday . . . Friday's game in Houston is the first of three in a row on the road for the Spurs, who play at Boston on Sunday and at Charlotte on Tuesday . . . San Antonio has 10 games left in the regular season, four at home and six on the road . . . The Spurs are the only NBA team with an all-time winning record against every team in the league. They lead the series against Houston 108-88 . . . Friday's game will be the last regular-season meeting between the Interstate 10 rivals. The Rockets lead the season series 2-1. As NBA playoff contenders jockey for position with three weeks left in the regular season, the league’s Western Conference standings remain remarkably close – and fluid. Heading into Friday night’s key road game against the Houston Rockets, the Spurs are among four teams with identical records in the West. Defending champion Golden State (49-22) leads Denver (48-22) in the race for the No. 1 seed by only a half-game. No. 3 Houston (45-27) and No. 4 Portland (44-27) are separated by the same margin. The other four playoff contenders – No. 5 Oklahoma City, No. 6 San Antonio, No. 7 Utah and No. 8 Los Angeles Clippers – are all 42-30 and seeded by tiebreakers. Their nine-game winning streak snapped in a 110-105 loss to Miami on Wednesday, the Silver and Black start the countdown to their last 10 games of the regular season against a Rockets team that is 8-2 in its last 10 games. Coming off a 126-125 overtime loss in Memphis on Wednesday, Houston leads the season series against its Interstate 10 rival 2-1. Their longest win streak of the season behind them, the Spurs are looking inward and trying to stay focused on the main factor behind their surge in March – a recommitment to defense. 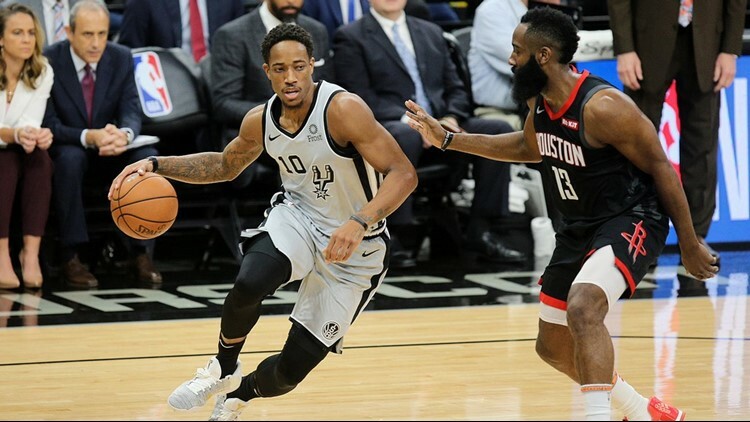 DeMar DeRozan is guarded by Rockets star James Harden, a childhood friend, in the Spurs' 136-105 loss to Houston on Nov. 30 at the AT&T Center. Thwarted by a zone defense Miami threw at them, the Silver and Black fell behind by 17 in the first half and trailed by 18 in the third quarter before they rallied. They outscored the Heat 31-28 in the third period and 27-20 in the fourth, but it was a case of too little, too late. San Antonio trimmed the lead to three twice – 106-103 and 108-105 – in the last two minutes. The first possession ended with DeRozan turning the ball over and the second with Rudy Gay missing a 3-pointer with 38.4 seconds remaining. Josh Richardson rebounded Gay's missed shot, but the Spurs got another chance to tie the game when DeRozan blocked an 18-foot shot by Richardson. DeRozan rebounded and took off on a one-man fast break. But DeRozan wound up committing a turnover when Wade poked the ball loose from behind, and the Heat regained possession with 8.7 seconds remaining. Frustrated with their inability to solve Miami’s zone, the Spurs fell into the trap of letting their offensive problems carry over to their defense. 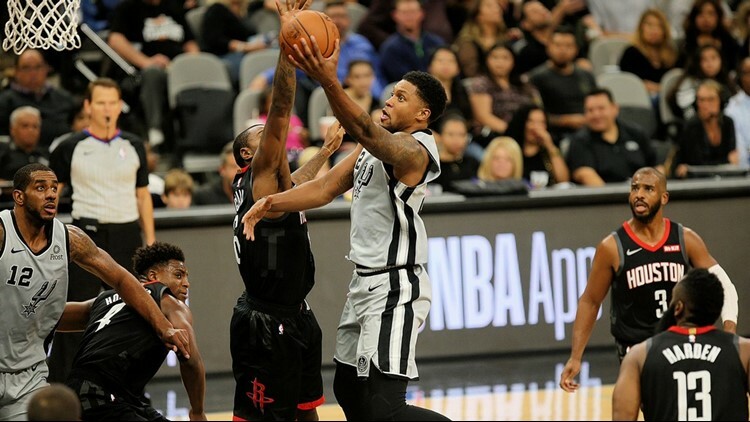 Rudy Gay, going to the basket in the Spurs' 136-105 home loss to the Rockets on Nov. 30, is averaging 14.2 points and 6.5 rebounds this season. Despite the disappointing loss, Mills said there was a silver lining. “A lot of positives that we can learn from this for very meaningful games when it comes to playoffs,” he said. “But this was good that we had this game, I think, to be able to see the way that we got exposed on not being able to move the ball. Spurs coach Gregg Popovich acknowledged that the Heat’s zone defense was problematic, but he stopped short of pinning the loss solely on that.